The new documentary 'Don't Frack With Denton' shows how an environment can make it tough for grassroots -- and how movements grow anyway. Tomorrow at Movie Tavern’s Denton location, a mini-festival of documentaries put on by Thin Line called Day of the Docs is free with registration. On the schedule at 5 p.m. is the second-ever public screening of Don’t Frack With Denton. The feature-length film by Garrett Graham and Candice Bernd debuted at VideoFest’s DocuFest this month. It’s a character-focused, linear tracing of Frack Free Denton’s evolution that begins with earnest first meetings at the Greenhouse restaurant and concludes with citizens’ arrests for civil disobedience as they blocked trucks in peaceful protest outside Vantage Energy in June of 2015. 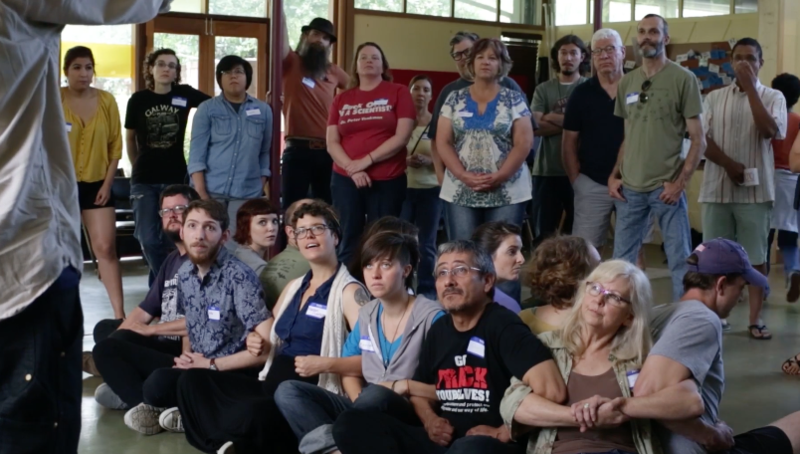 The group of concerned parents, college students, musicians and others first came together to mobilize voters who ultimately banned gas well drilling in 2014, only to have their victory overturned by the state seven months later. Don’t Frack With Denton‘s greatest merit is its reveal of this sociocultural chasm, one that hadn’t yet been articulated this fully by any reported story or essay on Denton’s dualities. When a pause hits on election night 2014 at Dan’s Silverleaf after it’s announced that voters have spoken and fracking is banned, we see the disbelief that marks real change. When Spoon prepares first-time protestors for the logistics of a sit-in, we see how much there was to learn, and how eager citizens of Denton were to learn it. Heavy-handed close-ups of asthma inhalers aside, the film acts as an important primer for groups looking to stand up in places where Republican leaders are leaning on preemption to make sure decisions to increase minimum wage or fight discrimination aren’t left to local jurisdiction. The very first shot in Don’t Frack With Denton is a march against climate change in Paris, France, a trip the filmmakers undertook on their own dime to show that friends to the environment in Denton had company. Another film that screened at DocuFest in the shorts block called Election Night looks at woes in the United States through an outside lens of empathy. It takes place as returns from the U.S. race for president come in overnight on the televisions in a London pub. More than anything, director Ryan Scafuro’s own cinematography and pacing orient us in our current situation of loss in a country helmed by Trump — less alone in our reality, perhaps, but acquainted again with the world-spanning impact of voters’ decisions and the forces that created them. Dallas VideoFest has released the schedule for its second leg, AltFiction, Nov. 2-5 at Angelika Mockingbird Station.